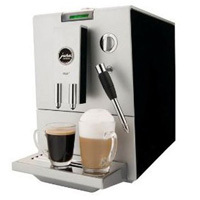 The simple controls of this Jura-Capresso super automatic coffee machine do not overwhelm the elegant front panel, which measures only 9 inches across. The entire coffee-making process, including the grinding, tamping, and brewing, takes only a minute, and the automated cleaning system makes maintaining the machine easy for you. We like having control over the coffee temperature and strength, and all through a simple rotary dial. For $719, this coffee maker produces thick, rich drinks quickly.